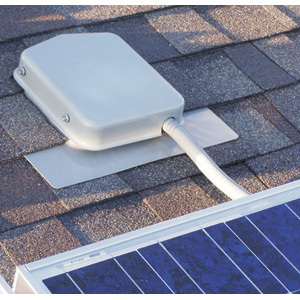 SolaDeck is a PV wire enclosure and seamless flashed product all in one. SolaDeck eliminates the multiple parts and respective labor typically needed to accomplish the roof penetration for a weather-tight wiring passageway into the home. Unique in the solar industry, SolaDeck is designed with a seamless flashing consistent with standard roofing practices for roof penetration. All SolaDeck models are third party tested by ETL to the UL50 Type 3R and UL1741 standards. 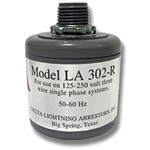 This ensures high quality and reliability of every model. These are NEMA 3R enclosures that give a flashed roof penetration for the array cables. They are all made from 18 gauge galvanized steel with a powder coated finish providing a professional look. All have a dual ground lug, a 6" (150 mm) universal DIN rail to mount fuse holders or terminal blocks. There are three roof deck knockouts (½", ¾" and 1"), and dimples to center a punch or drill for entry conduit or fittings, as well as a built-in roof flashing. To make pass-through connections inside a SolaDeck, use one or more 2-String Pass-Thru Kits. This kit has 4 DIN mount terminals that can be used with #6 to #16 AWG wire, and hardware to hold them in place. Each terminal is 10 mm wide. The SD-0786-41 is listed as a DC combiner and can be used with terminals or fuse holders for array DC wiring. For combining circuits, use up to 4 DIN mount fuse holders, each 18 mm wide, a positive and negative busbar, and a 2-string pass thru kit to combine up to 4 module strings. Or use the 2-position positive and negative busbars for combining 2 strings, with or without fuses. Fuses are not included, so order the appropriate fuses. These are Listed to UL 1741 for Photovoltaic Combiner Enclosures. The SD-0786-3R is listed as a j-box and can be used for pass through wiring of both DC and AC circuits, but without combining circuits. Both SD-0786 are only 2.5" deep and can fit under the array. The SD-0786-41 is listed as a combiner for both AC and DC circuits and has a bump in the lid to accommodate DIN mount DC or AC breakers. The SD-0786-41 is 6" deep for use on tile roofs. It comes with a 30" square soft aluminum flashing and can be used as both AC and DC combiner or pass through. These are Listed to UL 1741 for Photovoltaic Combiner Enclosures.